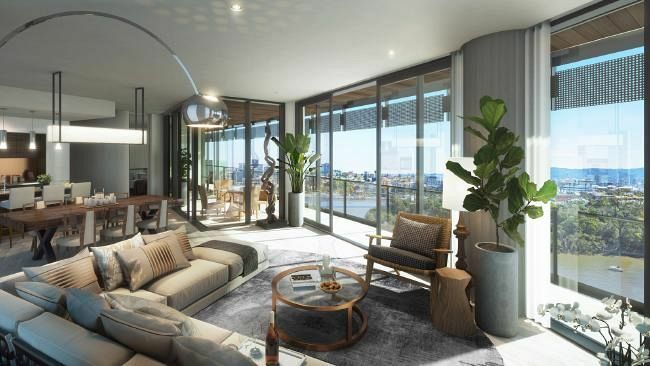 Superannuation-backed developer Cbus is pushing ahead with a luxury high-rise development in Brisbane after securing almost $160 million in sales. In a sign of confidence in the luxury end of the Brisbane market, the CBD riverside tower 443 Queen is set to start construction next month. Property CEO Adrian Pozzo said the construction timeline would provide certainty to buyers and was expected to lead to more sales. Backed by about $40 billion in super funds, Cbus is funding the development internally. The 264-apartment tower has almost sold out of one-bedroom units, while the four-bedroom towers apartments — with prices ranging from $2.2m to $3m — are 50 per cent sold. Sales launched for the development about nine months ago. Completion is expected in the third quarter of 2020. CBRE managing director Paul Barratt, who is marketing the development, said the site and subtropical design elements made the project “genuinely irreplaceable”. The WOHA Architects and Architectus-designed building will have gardens on each level and natural ventilation. Cbus has been bullish on the apartment market, kicking off the 202 apartment Collins Arch residential development in Melbourne last year. The $1bn twin-tower project, to be connected by a sky bridge, also includes commercial space. The next development to be launched is expected to be the redevelopment of Sydney’s Inglis stableyards in Randwick into 750 apartments, following approval in the Land and Environment Court. In Brisbane’s high-end market, developer Spyre Group has started building on its New Farm 22-unit project, Zahra. The $41m development on riverside Oxlade Drive will feature three and four-bedroom units in an appeal to the downsizer market, with an average price of $1.83m. More than 50 per cent of the project has been sold and Hutchinson has been appointed to build the development, with completion expected by end 2018.